'Tis the season for all manner of celebrations. 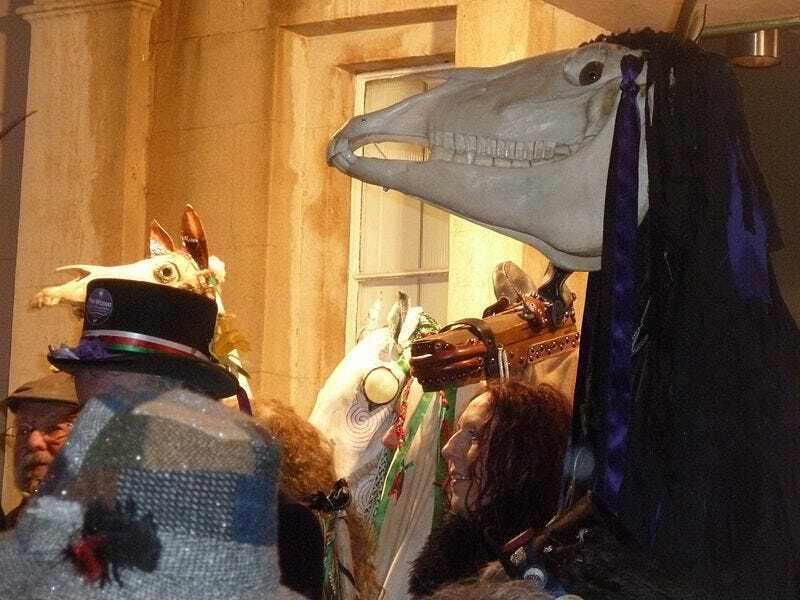 But, while some holiday traditions (like reindeer sweaters and the foisting of cookies on any and all unsuspecting visitors) have picked up traction, others (like your friendly neighborhood Mari Lwyd, pictured above) remain sadly obscure. Today, we asked you to let the rest of us in on some of your own favorite local holiday traditions. Here are just a few of the different ways you told us you'd be celebrating this year — ranging from ice-swimming to welcoming Santa and his salmon-driven sleighboat. What&apos;s Your Favorite Local Holiday Tradition? Parrandas (or Asaltos), friends and family wake you up with singing (sometimes drunk), and you're supposed to open your doors, feed them, give them more drinks, and maybe join them. The last place on this musical home invasion tour gets the honor to make asopao (a hearty soup), and get woken up around 4 or 5 in the morning. My mom made excellent asopao, so we were usually the last stop for all parrandas. This can happen any night during Christmas time and require people to prepare beforehand, of course, but there is little warning when it's going to happen. Parrandas sounds like what Russian Orthodox followers call Starring. We spin a giant wooden star that represents the Star of Bethlehem while we sing in people's houses, and their holy pictures that are displayed are crossed over with a star, usually of garland. We celebrate Christmas on January 7 (because screw the Gregorian Calendar) and we do this for three days leading up to it. Hosts of the Starrers also give food and drink, and hard candy for the children and are usually up until dawn (or until every house has been sung at). When I was living in Prague, I noticed that two weeks or so before Christmas, blue plastic barrels started appearing on street corners. It turns out that the Christmas dish of choice there is carp, and it works like this: If you want the best carp selection, you buy early and have your choice of all the carp in the barrel. The seller wraps the fish up in paper, you scamper home, and keep it in the bathtub until it's almost Christmas. Then you have to kill the thing yourself. It is not unknown for household children to get attached to that carp, which will have to be released in a convenient local pond, and another carp subbed in. If you don't want to kill and dress it yourself, you have to wait until you have less selection, but then WHAP! they'll take care of it for you right there on the street corner. Everyone is super-into the Krampus now, but for my money it's the bloody butcher's slabs on the sidewalks that add the appropriate frisson to the central European Christmas. In Kodiak, AK we used to have a boat parade in which boats would line up and come through the channel all lit up with Christmas lights. However, because weather usually turns ugly in the winter and we don't want the boats (and the crewmen!) to be in danger, we host it at the harbor now. Here's some pics from this year's. Yes, That's Santa's sleigh being pulled by salmon. On New Years Morning, still-drunk revelers cut a hole in the ice on the local lake and go swimming in the frigid water. Apparently it is good for a hangover. Here in Wales, Y Fari Lwyd travels to homes and pubs, bringing luck in exchange for food and especially drinks! I'm Welsh and as such think there is nothing more Christmasy than sticking some ribbons onto a horses skull and scaring your neighbours into giving you booze. Well, besides building giant goats (the yule goat is what used to bring us presents in Sweden before Santa entered the mix via Germany by way of the US and Coke), we have a very quaint traditon: at exactly 1500 hours on Christmas Eve, literally everyone (well, 80-90%, so not literally literally) sit down to watch a compilation of Disney shorts called Donald Duck and friends. Halifax sends Boston a big Christmas/Holiday tree as a thank-you for assistance Boston gave after the big Halifax explosion in 1917. Yay international cooperation! Add your own favorite celebrations into the comments!